A hydrostatic transmission or closed-loop system, is an extremely popular vehicle drive system mainly because it has a number of unique features which are not found in most conventional manual and power-shift transmission drive systems. The most desirable feature is that neutral, forward, reverse, ground-speed, and braking, are all controlled via a single, hand-lever or foot-pedal. They are extremely popular for wheel drives in many types of mobile and industrial equipment. Some examples include: skid-steer loader-type vehicles, landscaping equipment, track drives, conveyor drives, construction equipment, etc. While neutral, forward, reverse, and, ground-speed are inherent design features, the braking feature IS NOT. The brake system is simply a by-product of the dynamics which naturally occur when the pump swashplate is moved from the forward or reverse position, to the neutral position. Unfortunately, there are machinery and equipment manufacturers who choose to ignore the warnings given by hydrostatic transmission manufacturers in their respective engineering application guides. Also, maintenance management and technicians are inclined to ignore the maintenance and service of the actual brakes because they seem redundant. A hydrostatic transmission is a very simple hydraulic system. A typical vehicle drive system consists of a hydraulic pump which is driven by the prime-mover, and a hydraulic motor which turns the drive wheels (Figure 1). Depending on the design and application of the vehicle, the drive system can be configured a number of ways, e.g., a single pump driving two motors, two pumps each driving its own motor, etc. When the control lever is moved to the forward or reverse position, the swashplate moves, causing the pump pistons to begin to reciprocate as they follow the contour of the angled plate (Figure 2). When the pistons are pulled out of their respective cylindrical chambers, the chambers fill with oil. When the contour of the angled swashplate causes the pistons to travel in the opposite direction, they displace the oil behind them which causes flow. The motor swashplate is always at an angle. 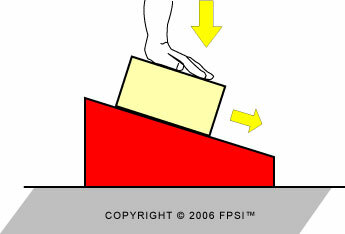 Here is how it works: If a block is placed on an angled plane and a downward force is applied to the block, it will be inclined to slide down the angled plane (Figure 3). Likewise, if a moveable piston is contained in a cylindrical barrel and a downward force is applied to the piston which rests against an angled plane, the same dynamics occur - the force against the piston causes it to slide down the angled plane (swashplate). 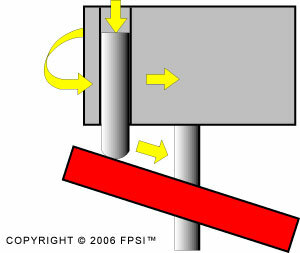 Since it is contained in the barrel, it causes the barrel to rotate which, in turn, causes the output shaft to rotate (Figure 4). Visualize, that pushing the piston by-hand or pushing it with oil is, for all intents and purposes, the same. The motor can be fixed-displacement, or variable displacement. It can also be a gear-type, vane-type, or, piston-type motor. When the machine operator moves the direction and speed control lever to the forward or reverse position, the pump immediately begins to produce flow (Figure 5). Pump flow passes through a transmission line (typically) into the motor and causes the motor output shaft to rotate. As the motor rotates, it causes the vehicle to move. It is important to note that the motor, regardless of type, will always rotate when oil flow passes through it. In the case of the axial piston motor design, the swashplate, even if it is variable, does not move to the neutral position or zero swashplate angle. When the operator moves the direction and speed control lever from the forward or reverse position to the neutral position, the vehicle comes to an abrupt halt  it brakes! (Figure 6). This inherent braking is caused by nothing other than stopping the oil flow which naturally occurs when the pump swashplate is placed in the neutral (zero) position. Lets go through the process in slow motion - The prime-mover (engine or electric motor) drives the hydraulic pump. Pump flow travels through a transmission line, which is connected to a motor, and causes the motor to rotate. The vehicle is now in motion. When the pumps swashplate is moved to the neutral (zero-angle) position, while the vehicle is in motion, it is reluctant to stop due to the vehicles inertia. This inertia transforms the vehicle into the prime-mover. The prime-mover turns the motor which, of course, converts the motor into a hydraulic pump. However, unlike the motor, the pump swashplate is in the neutral position which simply means that oil flow cannot cause the pistons to move  the oil flow path is blocked which causes the motor to lock-up. 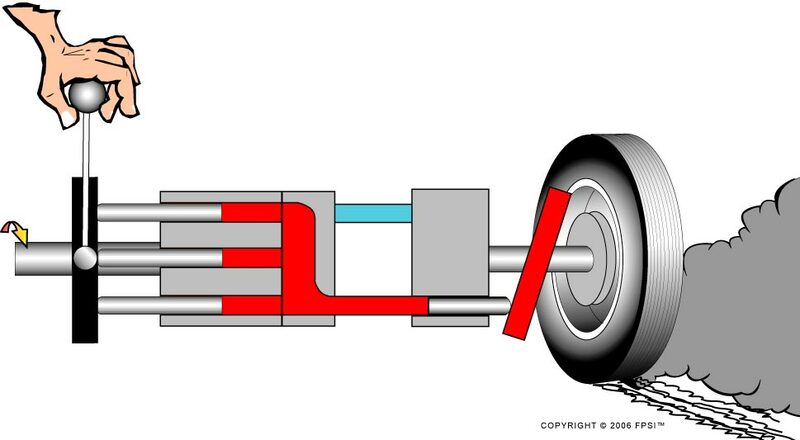 And this, is the extent of the braking system within a hydrostatic transmission. 1. Lose the oil in the reservoir due to a transmission line failure (even if the failure is in an unrelated circuit). 2. Shear a motor or pump shaft. 3. Shear a pump or motor drive coupling. 4. Lose a transmission line unexpectedly due to wear or neglect. 5. Barrel lift-off due to wear or over-speeding (in some designs). 6. Wear in the pump and/or motor. 7. Contaminated or defective valves: charge pressure relief valve; main pressure relief valve; shuttle valve; etc. As I travel around the country conducting safety workshops I am deeply disturbed at the numbers of vehicles which are in current use, and DO NOT have brakes  many by design  beyond what lies within a hydrostatic transmission. 1. Utilizes the hydrostatic drive as its sole braking system tag it out and call the manufacturer. 2. Has a separate braking system which is defective, tag it out of service until it has been properly repaired. 3. Has only a parking brake but no primary brake system other than the hydrostatic drive system tag it out until it has been certified safe by the manufacturer. 4. Has a brake system in addition to the hydrostatic braking system which DOES NOT stop and HOLD the vehicle when it is in motion, tag it out until it has been certified safe by the manufacturer. 5. Breaks unexpectedly into freewheel when it is traveling on an incline or decline, tag it out until it has been repaired. Failure to heed the above warnings can lead to an accident which could result in severe injury or death.